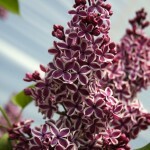 A large shrub with fragrant panicles of purple-red flowers edged with white. Blooms in mid-spring. Attractive to hummingbirds and butterflies. The only lilac we know with picotee (white-edged) flowers. It prefers in full sun in a well-drained soil. Prune after flowering to promote future blooms.